Today is edevere17.com’s third birthday. Time flies! I’m celebrating with a survey. It’s an experiment, to find out who reads this first heir of my reinvention, or at least to see who’s interested enough to respond. If you choose to spend a few minutes with it, thank you. Pick the answer that fits best. If none apply or if you don’t like the question, no problem, skip it. I will only see the pie-charted results, not IPs nor any other identifying information. 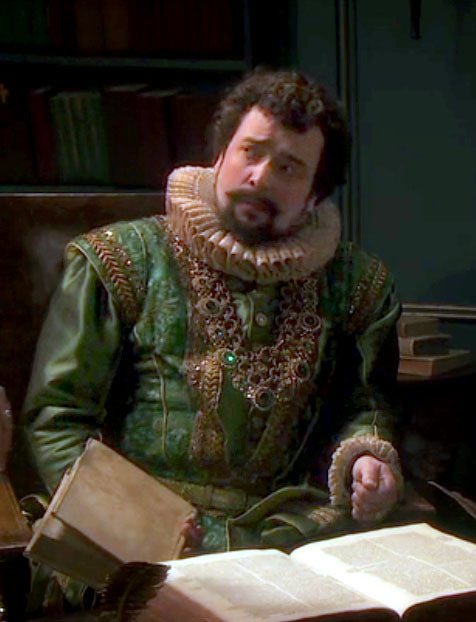 The final question deals with BBC2’s silly Willy sitcom, Upstart Crow. The episodes involving the authorship issue aired on the 5th and 12th of September in the current third series – #2 Wild Laughter in the Throat of Death, and #3 If You Prick Us, Do We Not Bleed?. Dan Tetsell had a small role as me in episode #2. That’s him in the photo, looking nothing like. Not surprisingly, the whole business was wrong as wrong could be, but I don’t make it onto the telly very often so I enjoyed it anyway. You can choose up to three answers for this one. Thanks again for your time, your support, and for being part of my 21st-century audience. Posted on 1 October 2018 3 April 2019 by @edevere17Posted in Announcements, Authorship (of Shakespeare), Reader Input, ShakespeareTagged BBC, Birthdays, Cinema/Television, Survey/Poll, Upstart Crow (BBC programme).